Scotland is unique in its castle tradition and the North East has more castles per square mile than any other part of the country. Varying from solid medieval fortresses to fairytale towers, many of these castles are open to the public. Some are just ruins now like Castle Roy in Nethybridge that you can visit and have a walk around; many are maintained and encourage visitors on a fee paying basis to help them with their upkeep. Most of the following castles have cafes which are very good but why not take a pinic to enjoy in their gardens, nothing better on a sunny day. Ballindalloch Castle, 13 miles from Grantown on Spey and on the Malt Whiskey Trail, sometimes known as The Pearl of The North is one of the most beautiful and renowned castles in Scotland. It is situated in the heart of Speyside, near to the famed local malt whisky distilleries of Cragganmore, Glenlivet, Glenfarclas and Glenfiddich. Surrounded by majestic hills, and with the waters of the Rivers Spey and Avon flowing through the grounds, the setting is truly magnificent. A much loved family home, Ballindalloch is one of the few privately owned castles to have been lived in continuously by its original family. The Macpherson-Grants have resided here since 1546. Ballindalloch dates from at least the 16th century. The main tower is plainly of this period. The date 1546 is carved on a stone lintel in one of the bedrooms, providing a more precise date for the construction of the Castle. Ballindalloch Castle exemplifies the transition from the fortified tower house necessary in 16th century Scotland to the elegant and comfortable country house so beloved of the Victorians in the Highlands. The present family continue to improve the Castle and the Estate, and are pleased to welcome visitors to their home. 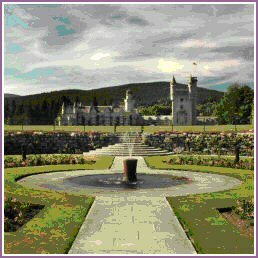 Balmoral castle, about 40 miles away, situated on the other side of the Lecht ski resort from Grantown, is set amongst the magnificent scenery of Royal Deeside. Bought by Queen Victoria in 1848, the Estate has been the Scottish Home of the British Royal Family ever since. The Estate extends to just over 50,000 acres of heather clad hills, ancient Caledonian woodland, policies and of course the beautiful River Dee is nearby. Over the past 150 years careful stewardship by the owners, The Royal Family, has preserved the wildlife, scenery and architecture which is available for all generations to enjoy. In her journals Queen Victoria described Balmoral as “my dear paradise in the Highlands”. Now open from 1st April until 31st July. The Royal family use Balmoral from August. 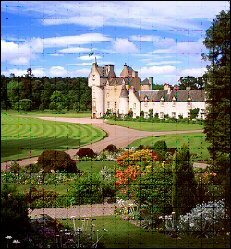 Brodie Castle (on the Nairn/Forres road, A 96, about 24 miles from Grantown) was originally built in the traditional Z plan, but has been much altered and enlarged over the centuries. The castle itself was the home of the Brodie family until the late 20th century. In fact, the family’s association with the area goes back further than the building of the castle, possibly as far as 1160 when it is believed Malcom IV gave these lands to the Brodies. In 1645, the castle came under attack from Montrose’s army and sustained some damage. Today, you can still see the additions made to the building in the 17th and 19th centuries. In spring, the grounds are carpeted with a unique collection of daffodils. You’re free to explore sheltered woodland walks, and stroll by the pond where you can observe the estate’s varied wildlife from the specially constructed hides. Now owned by the National Trust of Scotland you may walk for free in it’s grounds or pay to enter the castle. 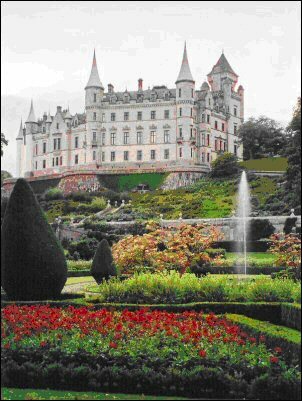 Dunrobin Castle is 85 miles north of Grantown and makes for a wonderful day out. It is the oldest continuously inhabited castle in Scotland, dating in part from the early 1300s, Dunrobin Castle has been called home to the Earls and Dukes of Sutherland since the 13th century and was first mentioned as a stronghold of the family in 1401. The Earldom of Sutherland is one of the seven ancient earldoms of Scotland and the Sutherlands were one of the most powerful families in Britain with many important matrimonial and territorial alliances. . The Earldom of Sutherland was created in 1235 and a castle appears to have stood on this site since then, possibly on the site of an early medieval fort. The name Dun Robin means Robin’s Hill or Fort in Gaelic and may have come from Robert, the 6th Earl of Sutherland who died in 1427. 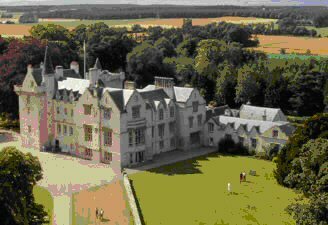 Remarkably this early keep still survives, much alteredmaking Dunrobin one of the oldest inhabited houses in Scotland. Falconry is the ancient art of hunting with birds of prey. A visit to Dunrobin Castle now includes daily birds of prey flying demonstrations at 11.30am, and 2.00pm on the Castle lawn. See spectacular shows featuring golden eagles and peregrine falcons, both resident birds in the Scottish Highlands. Learn more about other local birds of prey as well as the ancient art of falconry. Additional attractions include more exotic species such as the South American Chilean Blue Eagle and European Eagle owl. Visitors are encouraged to hold, fly and feed these wonderful birds of prey and every show creates superb photographic opportunities. Birds of prey and Falconer are available until 3 pm every day for photographs. 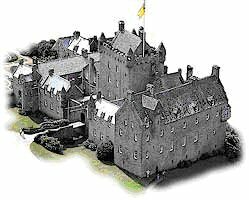 Cawdor Castle is romantically linked by Shakespeare with Macbeth and is 30 miles from Grantown. A superb fairy-tale castle and a splendid house – the home of the Cawdor family to this day. Cawdor Castle dates from the late 14th century and was built as a private fortress by the Thanes of Cawdor. The ancient medieval tower was built around the legendary holly-tree. Although the House has evolved over 600 years, later additions mainly of the 17th century were all built in the Scottish vernacular style with slated roofs over walls and crow-stepped gables of mellow local stone. This style gives Cawdor a strong sense of unity, and the massive, severe exterior belies an intimate interior that gives the place a surprisingly personal, friendly atmosphere. Good furniture, fine portraits and pictures, interesting objects and outstanding tapestries are arranged to please the family rather than to echo fashion or impress. Castle Roy on the northern edge of Nethybridge, may have been built soon after 1226 by James, son of the Earl of Mar, to whom Alexander II had granted the lordship of Abernethy. One of the oldest castles in Scotland, it is a simple enclosure with plain curtain walls and tower protecting those who lived in wooden lean-to buildings within the courtyard. Uruquhart Castle approximately 55 miles from Grantown on the shores of Loch Ness is a ruin now but has a very interesting Visitor Centre in its grounds. As a romantic ruin, Urquhart Castle must be the envy of romantic ruins the world over. It’s not just that its intriguing shape reflects the irregular outcrop of rock on which it was built. And it’s not just that for the last millennium or more this site has been the key that unlocks the major route through the Highlands. 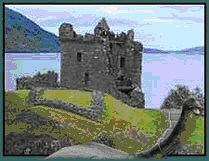 What makes Urquhart Castle the definitive romantic ruin is the possibility that the 600 foot deep waters surrounding it on three sides may suddenly ripple, then part, as something completely unknown to science emerges to confound a sceptical world. Nessie may or may not exist but the possibility that she does provides a powerful draw to the visitors who flock to the area year after year. And although Loch Ness has roads on both sides, access to the loch is relatively limited, and the views from the A82 are often restricted by trees, especially in Summer. There are many castles in Scotland that are more complete, and some that are larger but there are few with quite such a turbulent history, and even fewer located in such beautiful surroundings. And in no other do you have the chance, however faint, of taking a photograph that proves that dinosaurs are not, after all, extinct. 2002 saw the opening of a new visitor centre. This is built into the hillside beside and below the main road and offers much better car and coach parking as well as a spacious shop, cafe, audio-visual displays and a superb model showing the castle in earlier, less ruinous days.